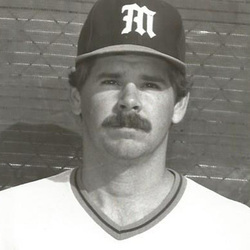 Jeff Morrison came to Coral Gables as a four-time All-Conference pitcher at Atlantic High School in Delray Beach, having been named the 1977 All-Area Player of the Year by the Palm Beach Post and the South Florida Sun-Sentinel. The lefty made an immediate impact on Coach Ron Fraser's 1978 team as a freshman, winning 5 games, posting a minuscule 1.59 earned run average (ERA) and helping lead the Hurricanes to Omaha and the College World Series for only the second time in school history. But for Morrison and the Canes, the best was yet to come. Another in the long line of great Hurricane lefthanders, Morrison teamed with UMSHoF member Neal Heaton to form one of the finest one-two pitching punches in college baseball history, the duo leading the Canes to the College World Series three straight seasons (1979-1981). As a sophomore in 1979, Morrison went 12-1 in 21 starts with a 2.50 ERA. In 1980, he suffered a rotator cuff injury and was forced to start the season as a reliever, working his way back into the starting rotation and finishing with a 9-3 record and leading the team with a 2.03 ERA, the 8th best season average ever at UM for pitchers with 100-plus innings pitched. As a senior in 1981, Jeff compiled a 12-1 record and a 2.93 ERA with five complete games and two shutouts. The winning pitcher in both the 1978 and 1979 Atlantic Regional championship games that propelled the Canes to the College World Series, one of Jeff's proudest accomplishments is that he never lost to either the Gators or the Seminoles in his career. Morrison's career 2.37 ERA is fourth all-time for pitchers with 200-plus innings pitched. His 38 wins (38-6 overall) ranks fifth all-time, he is tied for 6th in career complete games (15) and seventh in career innings pitched (387). He was selected three times in the baseball draft (1977, 80, 81). A member of Iron Arrow, the highest honor one can attain at the University, Jeff and his wife Sarah, a former UM diver and graduate, have 2 children, Michael and Susan. Jeff graduated from Miami with a Bachelor of Business Administration degree with a joint major of Economics and Politics and Public Affairs, and was named the School of Economics Student of the Year. Named a three-time COSIDA Academic All-American, he was awarded the NCAA Post-Graduate Scholarship, received his law degree from Georgetown University, and spent the next 30 years as an attorney in Atlanta. A recent retiree, Jeff is working on his Doctor of Philosophy degree at Georgia State University in Atlanta, and will begin a second career this Fall as a History Professor specializing in U.S. Legal History.